Pro Dunk Hoops is family owned and operated and has been for 32 years. Our basketball goals are engineered with 50% more glass and steel versus store brands and are competitively priced because we sell manufacturer direct. 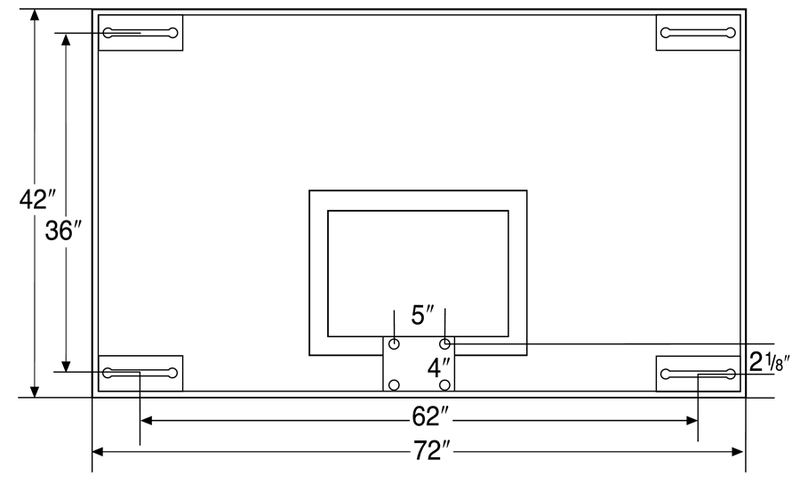 Complete regulation backboard system with 1/2" thick tempered glass etched with shooter's square and perimeter markings. Framed in aluminum and reinforced with powder coated steel frame. Includes rim mounting glass cut out and predrilled steel frame ready to accept rims with a 5" x 5" hole pattern. Steel frame has slotted holes at all four corners of the 72" wide x 42" tall backboard for easy mouunting to a variety of structures. Although meant as a replacement board for gymnasiums, everything is rated for outdoor use perfect for custom jobs like wall mounting if you can do some fabrication work. Weighs 195 lbs.